Syno 'DC' Series offers a range of Dosing & Metering Pumps with Syno's innovative design, quality workmanship and reliability. This Series is specifically designed for low flow, metering or dosing applications - offering continuous and accurate repeatability. 'DC' Series Pumps are used for feeding intermittently or continuously a controlled quantity of fluid / chemical within pre-determined time or at fixed intervals. The compact 'DC' pumps have high tolerance to aggressive chemicals and the renowned reliability of Syno. The repeatability accuracy has less than 1% fluctuation. 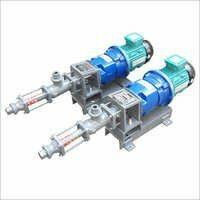 These pumps are self priming, and the gentle non pulsating pumping action helps maintain product integrity with even the most difficult materials. The range of suitable substances includes viscous and slurry products, solids in suspension and air/liquid/solids mixtures. These versatile pumps have output directly proportional to speed. These are in hot demand by chemical processors, pharmaceuticals, photo film, textile, cosmetics, petroleum, confectionery, detergent, beverages and host of similar industries.